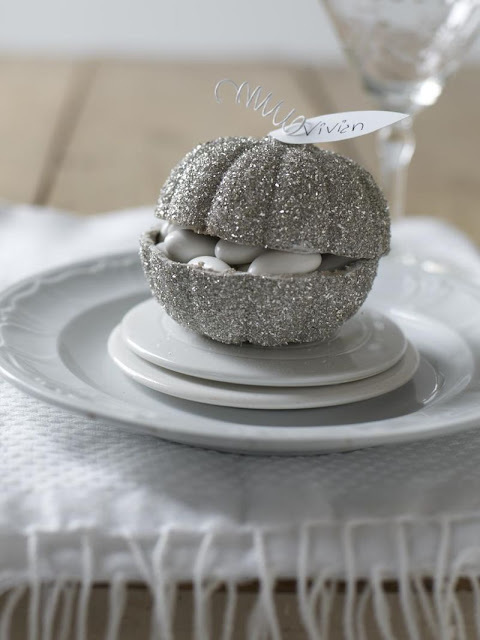 Sweet Paul's glitter box Halloween-inspired place card is sparkly and easy to create. Use it at your next dinner party to create a glimmering effect. Place candies & sweets inside for a fun treat! Cover a pumpkin shaped cardboard treat box with craft glue and then glitter. Hot glue a small paper leaf on top as the place card, and create a stem with white florist wire. Hot glue in place. Easy!